I have a few people on my shopping list that are hard to buy for. It’s mainly the men in my life. None of them have given me a direct answer when I asked them about their Christmas wishlist. Take my dad for instance. He would probably be happy with a bottle of cologne or a new tie, but would he actually use it? Probably not. He isn’t one to be very forthcoming with things he would want. I think it’s because he’s such a giving person that he doesn’t ever think to ask for anything specific for himself. On the other hand, there is my sister’s boyfriend, Jamie. I only met him last year and he doesn’t live in town so I don’t know him that well yet. What do I buy him for Christmas? I guess I could ask my sister what he wants, but I’d rather the gift be a surprise for both of them. What I’m doing this year is buying gift cards for the hard to buy for people on my shopping list. I know I enjoy receiving gifts cards because then I can have fun shopping for things I want. I’m thinking my family members will want to do the same thing. I’m buying my gift cards online at CardSwap again this year. CardSwap is Canadian site that allows users to buy gift cards and earn rewards as well as sell unwanted gift cards for cash. You can even donate gift cards to a charitable cause if you wish and receive an official tax receipt. Sweet! CardSwap helps solve a problem for Canadians. Consumer Reports magazine estimates that one in every four gift cards remains unused more than a year after it was received. The gift card is then often thrown away or lost. That works out to be a big chunk of change: $1 billion a year! The average Canadian household has over $300 unused gift cards lying around. I bet if you looked around your home you’d probably find one or two. I have a few that I haven’t been able to use because we don’t have any stores close to me where I can use the gift card. Using CardSwap to sell my gift cards allows me to earn some extra money. I’d hate to think of them going to waste. Now if you’re like me and want to buy gift cards either for yourself to use or as gifts, you can do that right on the CardSwap website. 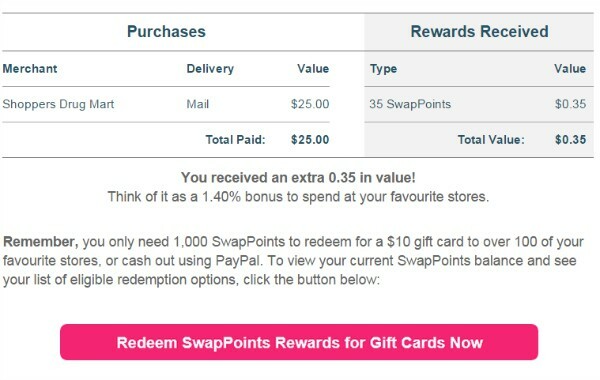 When you purchase your gift card you earn rewards known as SwapPoints. You can cash these SwapPoints in for gift cards. As you are browsing gift cards to buy, you can see how many SwapPoints you will earn for your purchase. 1,000 Swapoints translates into $10. You can take it out as cash or use it towards other gift cards. 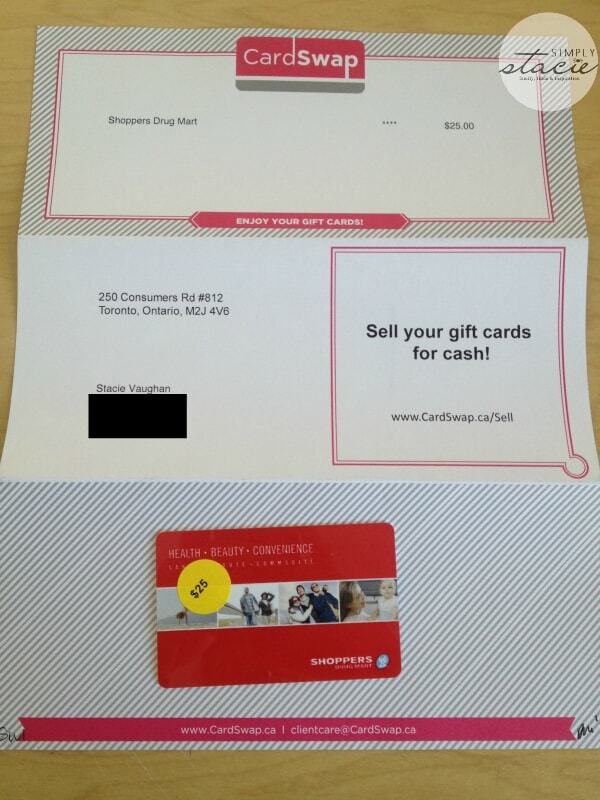 To illustrate how easy CardSwap is to use, I purchased a $25 Shoppers Drug Mart gift card. It was FREE shipping and there are no hidden fees. Pay either with Paypal, INTERAC or credit card. You can see the receipt of my transaction below and the SwapPoints I earned on that particular purchase. Their site says your gift card should arrive within a week. Mine came in a matter of 3 or 4 days. It was very fast! I don’t have to worry about the gift card I was receiving thanks to the CardSwap Guarantee. They validate all gift card to confirm the balance before its listed on their site. They guarantee that customers will never buy a gift card that doesn’t work or has an inaccurate amount. Every time I’ve purchased from CardSwap the process has been seamless and the cards worked perfectly. For my dad, I’m looking at a gift card to Mark’s Work Wearhouse. They have a store in the local mall and he can go shopping and get himself a new shirt or pair of pants. Plus, I’ll earn some SwapPoints on my purchase. Isn’t cashback savings great? CardSwap also has a special promotion going on right now: For every new CardSwapper that registers for FREE on our site- they will receive 500 SwapPoints which translates to $5.00 in SwapPoints. 1,000 gets you a free gift card for $10.00! Connect with CardSwap on Facebook and Twitter. Get Your Home Holiday Ready in Seven Days – A Merry Maids “Season’s Cleanings” Tip! Join the #AlexiaHolidays Twitter Party on 12/8 at 8 pm EST! I would choose the walmart card. I would get an Earls gift card! Indigo/Chapters, but it’s hard to choose! I would choose Shoppers Drug Mart card. I would choose a CVS gift card if I won! My first choice is a Tim Hortons card because it would help me some money for my budget and bills. I would get a Shell Gas Card because gas prices are getting lower and it’d be great to benefit from winning and cheaper prices. I think Chapters Indigo would be my choice. I would also choose Shopper’s Drug Mart. They have everything from fine fragrances to groceries! I would probably choose Wal-mart. I would pick Shopper’s Drug Mart if I won. I would choose Jack Astor’s. I would like the Walmart gift card. I would choose Shopper’s Drug Mart or Walmart. I would choose Indigo/Chapters if I won. I would like to get Shoppers Drug Mart. Old Navy would be one that I would want! I would probably choose a Golf Town card for my husband. I’d probably get a Mark’s card so I can buy some clothes from my favourite store!! Walmart is always a good one.